How do teachers add a new reflection/journal? A: To add a reflection topic, hover over your name and select Reflection Topics. Input the Start Date and End Date (the dates your students can view topics e.g. one week or over a period of 4 weeks). Choose to add the topic as a School Reflection. This will allow for only one Placement Teacher in the school to add topics for all students. Q: How do I mark a Student’s Reflection? 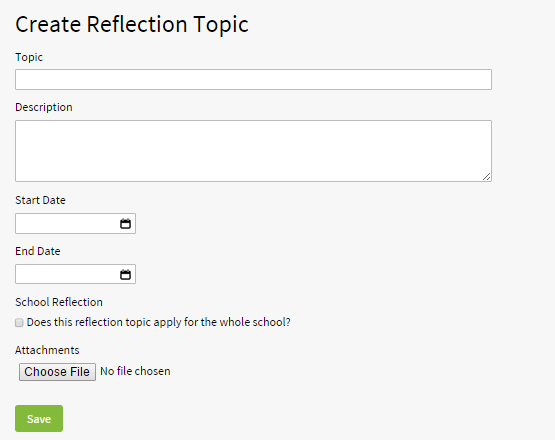 A: Click on the Reflections button to review, mark and leave comments on student reflections. Click the Save and Approve button to save the mark and comment. Q: How Do I Add a new Reflection Topic? Choose to add an attachment. NOTE: Once the end date has passed, students will no longer be able to see the Reflection.